At long last, our troubled protagonist—violent, family-less, unable to conform—shakes loose his pursuers. We lean forward in our seats. The ocean is before us; the black-and-white frame blanches in the unforgiving sunlight. Long a source of comfort for our hero, we are finally here. And the camera tightens on his face. A face defined by captivity, always hemmed in with fences and borders, sees the sea. And then… nothing. That’s it. We can go no further. The journey is over. The end. The 400 Blows needs no introduction. The opening salvo of the French New Wave, Francois Truffaut’s 1959 autobiographical exploration of the loneliest little juvenile delinquent in Paris ranks among the most personal, idiosyncratic, and beautiful of all films. The Creature Walks Among Us, released in 1956, is the third and final film in the Creature from the Black Lagoon series, the last of Universal Studios once-prestigious but always-profitable horror movie boom from 1931 to the end of the ‘50s. Never much revered beyond the iconic monster design, the three Creature films have always felt unique to me. There’s logic to them that you don’t see much elsewhere—each presses the story possibilities to the limit. Despite their low production values and occasionally dubious writing, director Jack Arnold feels committed to exploring the life of their star monster, the last of its kind. The first of the trilogy introduces us to the Gillman, the last survivor of a species of Amazonian amphibian men. It’s best remembered for an elegant little scene in which the Gillman swims with the leading lady, a scene that borrows its vibe and a bit of blocking from Jean Vigo’s L’Atalante. It’s an interesting influence for a monster movie, but that film’s sloppy French humanity definitely weighs on the Creature series – all celebrate a common “don’t let the bastards get you down” brand of heroism. Years later, a scene from Vigo’s Zero De Conduite would be recreated shot-for-shot in The 400 Blows. In the second film, Revenge of the Creature, the Gillman is captured and put on display at Florida’s MarineLand where ham-fisted efforts to humanize him go predictably wrong. Deeply, cosmically alone, the monster snaps and goes on a tear through the Gold Coast. A posse tracks him through the Everglades, where he’s mutilated in a brush fire in a failed attempt to escape into the ocean. Scientists manage to save the Gillman, but in the process they rebuild his face into a more human visage and are forced to remove his gills, turning him from an amphibian to a purely land-based animal, never again able to live in his watery home. So begins The Creature Walks Among Us. Director Jack Arnold never had a flair for regular drama (the three films are absolutely littered with perfunctory human subplots) but he always excelled when the stakes were weird. The great strength of the series is its willingness to treat the Gillman seriously, his loneliness as true and absolute. Through all the silliness, there are moments of great power, like the shackled Gillman still as a monk in his underwater prison cell in Revenge, or the newly gill-less Gillman’s near-death by drowning. 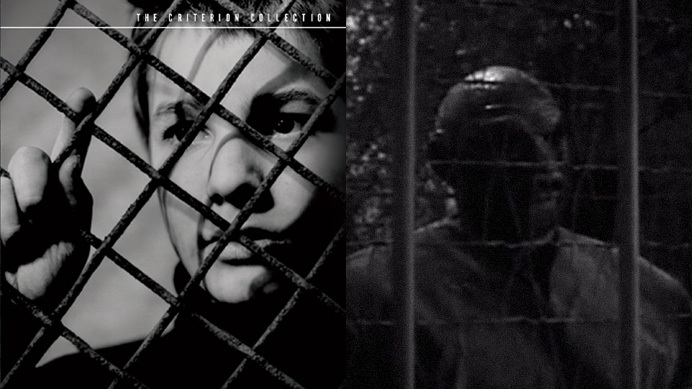 One shot in The Creature Walks Among Us, of the creature gazing wistfully through the chain links of his cage, anticipates almost exactly that famous shot from The 400 Blows that Criterion used as their DVD cover. It ends the same for the Gillman and for Antoine Doinel. The lone figure on the beach, with the authorities just moments away behind him, and with the empty inhospitable ocean before him. Truffaut never much liked the works of Jack Arnold, but nonetheless his films are just the sort of small American id-films that flooded France after World War II and introduced Truffaut, Bazin, Godard, and all the rest to the art of filmmaking. Truffaut once said: “An actor is never so great as when he reminds you of an animal—falling like a cat, lying like a dog, moving like a fox.” Add to that list: pining like the last of the late great monsters on the silver screen. This entry was posted in All Posts, John's Essays and tagged andre bazin, antoine doinel, creature from the black lagoon, francois truffaut, jack arnold, jean luc godard, jean vigo, john damico, l'atalante, proposed double feature, proposed double features, revenge of the creature, shot context, shotcontext, smug film, smugfilm, the 400 blows, the creature from the black lagoon, the creature walks among us, the gillman, zero de conduite. Bookmark the permalink. Do you think Truffaut might have also been thinking of The Land Beyond the Sunset? Good observation, could be! That’s a hell of a defining text for films about outsiders, and sort of a ten minute version of the whole of 400 Blows.